Microsoft already promotes the message that "Microsoft Edge is the faster, safer browser on Windows 10 and it is already installed on your PC," when you search for Firefox or Chrome via Microsoft Edge. Now it has been seen to be testing a significantly more obtrusive messaging method to try and swat away and stall the installation of rival browsers. The Verge reports that Microsoft is now testing a new warning the appears when a user goes on to attempt to run the Chrome or Firefox installers, on the latest version of Windows 10 for insiders. 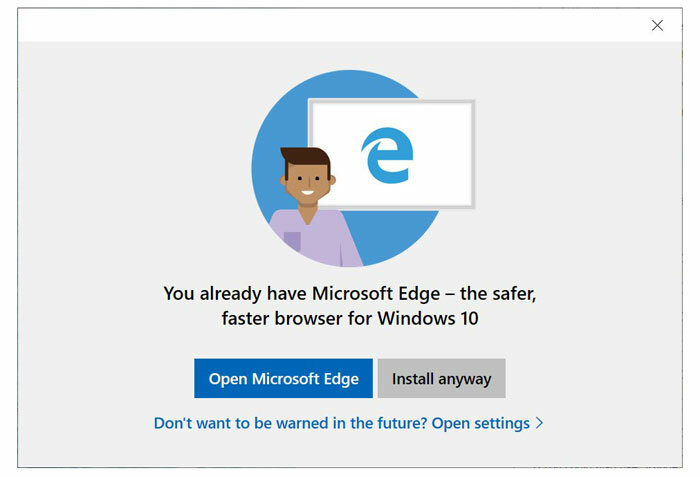 So, even though you are alerted about Microsoft Edge being the "safer, faster browser for Windows 10," when searching for Firefox or Chrome, this message is again shoved in your face when proceeding to run the installer. The existence of such a pop-up alert will be controversial with some PC users. However, Microsoft tries to counter this by allowing the warnings to be turned off "in the future". For the effort though, one might as well just click the 'install anyway' button in Microsoft's popup. According to the source report, while the warning is now in testing it isn't going to be included in the finalised Windows 10 October 2018 Update. It is noted that Microsoft often tests out feature changes and this one was both undocumented in the usual Blog posts and "appeared very late in the testing stages". Perhaps user feedback from Insiders will prevent this warning appearing in later shipping versions of Windows 10. Of course Microsoft would prefer Windows 10 users to stick with Edge for its associated benefits to the Bing search and ads platform. This business concern is obviously high up on the reasons for the warnings and alerts and why Microsoft has previously tried to tie Windows 10 Mail links to Edge, Cortana queries to Edge, and even pushed notifications to Chrome users to recommend Edge. There isn't an eyeroll gif on the internet that could possibly match, much less exaggerate the reaction appropriate for the cringe. I recently tried to install my new GPU. I did everything as usual by removing old drivers and so on. I popped in the new GPU and WHILST I was in the middle of installing the drivers from the CD (the resolution was 1024x768 so it was easier to install from that to just get thing working properly before then updating online), Windows decided IT wanted to install different drivers with no warning or way of stopping it. I'd given it time to see if it would install a generic driver and it didn't, so obviously it must have gone and downloaded one and then automatically installed it. Made a total mess of the whole thing and I couldn't boot into safe mode because that's now impossible to do before it boots. I was left to fix a PC that wouldn't display anything once it hit the Windows environment and couldn't boot into safe mode because for some pathetic reason they removed the boot options menu (you can get one, but you have to be able to get into Windows to enable it… MADNESS!). All because they decided that they knew better than the person who has been building and setting up PCs for decades and that a simple “we're about to install drivers for your new hardware, please click okay to continue or cancel if you intend to do this manually” box is too much. I get they're trying to make it easy but someone who doesn't know what they're doing and needs everything doing automatically and quietly doesn't go swapping out graphics cards. When you fix STUPID stuff like this, I will consider using your software more than the bare minimum I have to. Even your Outlook phone software is slow, buggy, bloated, pesters me to tell them how much I love it and uses >1% of battery per hour. That's around 28% of my daily battery use just for background emails…. everyone else can manage to write software that doesn't do this, why can't you?